The smartphone may stand as one of the greatest technological innovations of the early 21st century. This device has allowed us unprecedented access to the world around us, be it through text messages, internet browsing, or endless apps available today. The question is, how long will it take for some innovative person to create an app to open your garage door? Well, as it turns out, that day is here! In this article, we'll look at a few of the popular garage door opener apps available to you! A number of technology startup companies have created apps just for opening garage doors. One popular app is Garage Mate, created by BTMate. It is a free download for the first thirty uses, but after that, you must pay a small lifetime license fee. The good news is that the Garage Mate app works with a number of popular brands, such as LiftMaster and Chamberlain. Another popular app is Tap It Open, by Simon Says. Much like Garage Mate, Tap It Open uses Bluetooth technology and is compatible with a number of popular opener brands. The app is free to download, but the main drawback is that you're required to purchase a special kit, usually retailing for around fifty dollars. Each app has a set number of garage doors it can p[erate, and both of these apps, especially Tap It Open, come highly rated by consumers. If you were to ask a garage door contractor for names of popular companies in the field, they will spout names out such as LiftMaster and Craftsman. Given the long history of these companies in the field, it should come as no surprise that they too have entered the smartphone app arena. Craftsman, owned by Sears, has created an app for both iPhones and Android phones that doesn't rely on Bluetooth but instead uses the internet. The only drawback is that unlike other apps, the Craftsman app only works with certain Craftsman products. The LiftMaster app, also for iPhone and Android, is part of a larger system called the MyQ Internet Gateway, which boasts a number of security features, such as passcodes, and the ability to turn lights on and off. Will We All Have 'Smart Homes'? The trend towards apps as garage door openers may well be a step towards the 'smart home' concept, where a number of common household tasks, such as lighting and heating and cooling, will eventually be handled by phones and computers in a connected way. 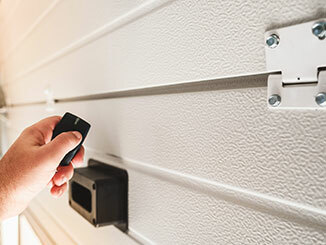 Advances in Bluetooth and internet connection technologies have enabled this trend, and as these technologies continue to advance, our experts at Garage Door Repair Bluffdale don't believe this trend will not stop anytime soon.